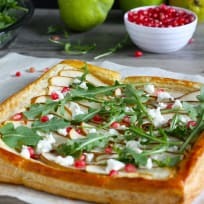 This savory pear and goat cheese tart can be made in no time at all. Perfect for when you need a quick appetizer dish. This vanilla pear gin fizz makes a fantastic fall cocktail. Cozy up with a warm sweater, good book, and this drink! This fall Panzanella salad is here to save your day. Lose the guilt from all those hearty comfort foods you’ve been eating, and dig in! A pear chai toddy is exactly what you need to warm yourself up. As the weather outside starts to drop, grab your sweaters, scarves, gloves, and a giant mug of this cocktail! This pear pomegranate mule is sure to be a hit at your holiday party. It’s just so darn festive! 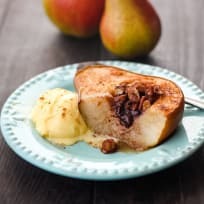 These paleo baked pears are drizzled with honey, stuffed with dairy free coconut milk yogurt and topped with a sweet pecan topping. 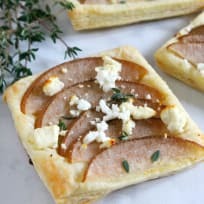 They’re a delicious pie-alternative to celebrating fall. This pear vanilla martini is your answer to any special occasion. It's a great way to toast the crisp Fall air! These spiced pear mini muffins might be small, but don’t underestimate these tasty bite size snacks. 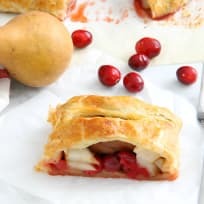 With tender, juicy pears and granola topping, these little muffins pack a lot of flavor into a small, whole grain bite. Walkers Shortbread Mini Apple Pear Crisps are everything you want to start Autumn off right. Buttery shortbread takes the crisp topping over the top!